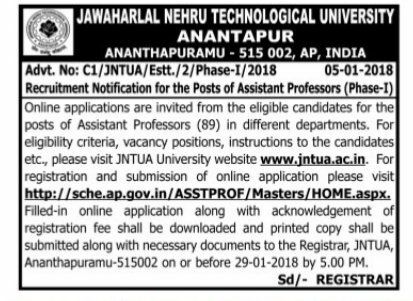 JNT University - Associate/ Assistant Professors, Last date for JNTU Professors recruitment 2018, JNTU FACULTY POSITIONS Recruitment 2018, JNTU Teaching Staff Recruitment 2018 - JNTU Anantapur invites applications for the post of Associate/ Assistant Professors and PROFESSORs in the Departments of JNTU Anantapur. For the application format, Prospectus with eligibility criteria, experience, registration fee and other details, please visit the University website, www.jntua.ac.in. Filled in applications, along with Registration fee of paid by way of Crossed Demand Draft Drawn in favour of The Registrar, JNTU Anantapur payable at State Bank of India, and should reach the undersigned on or before 29.01.2018 by 05:00 p.m.
Online applications are invited from the eligible candidates for the posts of Assistant Professors in different departments. For eligibility criteria, vacancy positions, instructions to the candidates etc., please visit JNTUA University website www.jntua.ac.in. For registration and submission of online application please visit http://sche.ap.gov.in/ASSTPROF/Masters/HOME.aspx. Filled-in online application along with acknowledgement of registration fee shall be downloaded and printed copy shall be submitted along with necessary documents to the Registrar, JNTUA, Ananthapuramu-515002 on or before 30.01.2018 by 5:00 PM.